Perennials make for a gorgeous garden that comes back season after season. But the longevity of perennials means you’ll need to make good decisions – and do a little homework – as you select and plant. 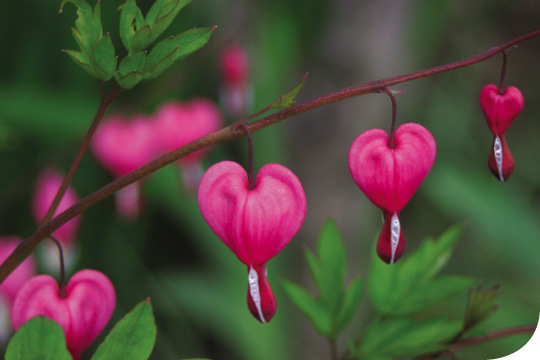 “Don’t just go to the store and buy whatever looks pretty,” advises Ginger Hudson, retail and horticultural special projects manager for Alaska Botanical Garden. Instead, ensure planting success by getting to know your yard’s micro-climates. 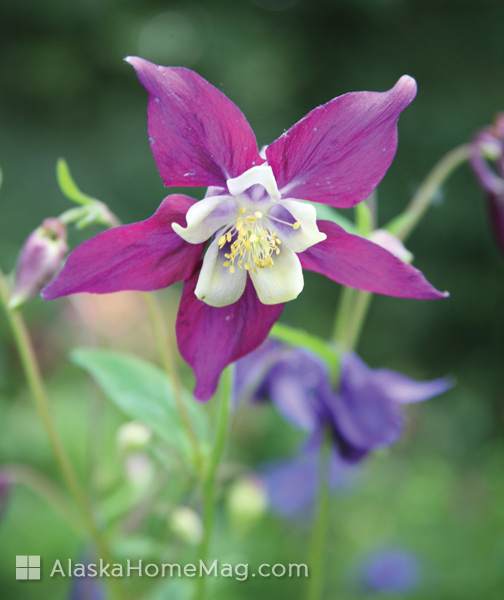 While some perennials love sun or do well in rocky soil, others prefer shade or deep soil. Factor in wind, too: Tall, lanky plants placed in high-wind spots will be shredded by a big gale. One key to having a successful perennial garden is allotting the right amount of space for each plant. Height will play a part, too: Keep taller plants toward the back of your garden, or in the middle of an island, to make sure lower-growing plants aren’t blocked from sunlight, and to create visual interest. In addition to scale, consider proportion. The wide beds and tall, imposing plants that lend drama to a large house and yard may overwhelm a smaller home, which is better served by a series of small beds. Hudson suggests sitting inside your house and looking out. “Is there something you want to be able to see? Choose elements that will draw you outside.” You might start with a focal point, like a boulder, an arbor or even a table where you can sit in your garden for a drink. Work out from there, pairing plants that provide contrast: big, bold flowers with delicate, airy blossoms, or tall, spiky stalks behind soft, mounded plants. Then bring unity to your garden by repeating plants or plant combinations throughout the bed. Or repeat colors by selecting plants with the same blossom shades. You could just plant flowers wherever it strikes your fancy, but by having a plan for where you’ll place different varieties, you’ll be sure your garden offers color throughout the seasons. You might draw a simple map, using different sized circles to represent different plants. The research you’ve done will come into play once again as you group early, mid-season and late-blooming plants together so that as one loses its bloom, the next is beginning to flower. “Getting color all spring, summer and fall just comes down to making sure you’re catching the season right and planning when each plant is going to bloom,” says Ricks. You can also use grasses to add texture. Fescue, for example, is a good textured short grass for mid-shade to sunny conditions. Hudson even suggests letting garden grasses grow into fronds at the end of the season to provide interest through the winter, as grasses become coated in frost and snow. As you’re branching out, why not include some edible perennials? Herbs like chives, mint and garden sage can bloom a long time, while groundcovers like strawberries and lowbush blueberries provide color – and a delicious treat. “Larger fruit trees also can lend structure to a garden and provide a nice background to your other perennials,” adds Hudson. And don’t forget vines like kiwi or hops that can twine themselves around an arbor for an elegant touch. With a combination of flowers, shrubs, vines and edible perennials, your family can enjoy a beautiful garden well past its last bloom – then look forward to the next spring, when your carefully chosen perennials come back again. 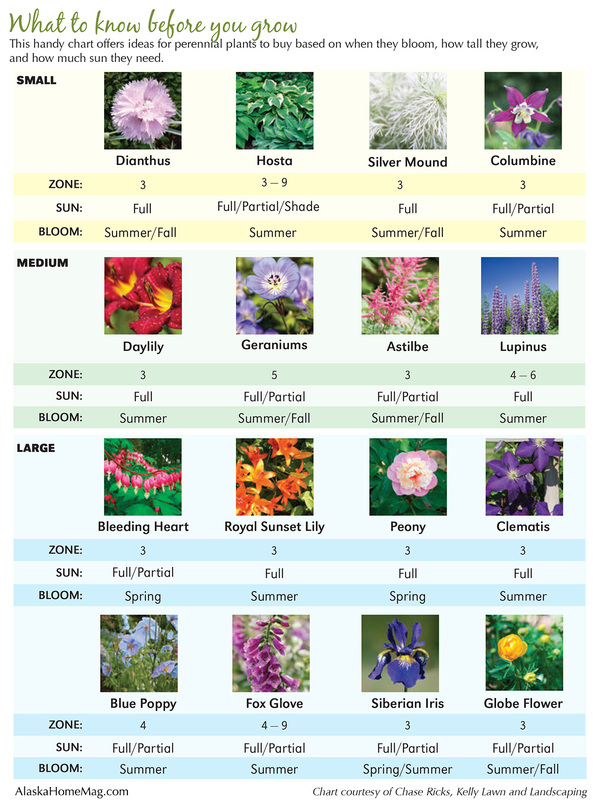 This handy chart offers ideas for perennial plants to buy based on when they bloom, how tall they grow, and how much sun they need.